If you’re greedy, as I am, there is no better place to enjoy an assortment of aesthetic experiences crammed into a concentrated form than a stately home. A good one offers paintings, architecture, furniture, sculpture, tapestries, interior design, gardens, land art, deer and peacocks. Some even have lions. Recently, however, these packed powerhouses of pleasure have managed to squeeze one more aesthetic variant into the mix, because a trend has arisen for stately homes to show off contemporary art. The most dramatic example is currently to be found outside Paris, at the Palace of Versailles, where Anish Kapoor has been unleashed on the baroque gardens and vainglorious halls of mirrors of Louis XIV. In the deepest recesses of hell, the Sun King will be revolving fiercely on his spit at the sight of Kapoor’s giant ear trumpets scattered about his lawns, or the polished mirrors in the sky adding a sense of Buddhist mystery to the baroque posturings he himself favoured. That’s in France. In Britain, we are spoilt for choice when it comes to intriguing mixes of pasts and presents. At Waddesdon Manor, near Milton Keynes, you can flit from the big-haired rococo beauties painted by Gainsborough to spooky conceptual love tokens made of human hair by the naughty Jane Wildgoose. Chatsworth, meanwhile, has opened its doors to the wild architectural fantasies of Pablo Bronstein in a two-part super-swap of old and new that also necessitates the transportation of an assortment of Chatsworth’s ancient treasures to the white cubes of Nottingham Contemporary. This cross-fertilisation of timescales has become fashionable because contemporary art brings in extra visitors. Sadly, the results can be dire. The Dublin-born conceptual popist Michael Craig-Martin should never again be allowed near a stately home. His display at Chatsworth last year featured clashes between the colours of Britain’s ancient past and the colours of Britain’s brightest felt-tips so jarring, they ruined the views for miles around. The approach works best in those situations where the aristocrats who own the homes are also collectors of real discernment, seeking to fulfil their traditional roles as patrons of art. In the past, our stately homes would habitually commission the best architects and artists. That’s why Houghton Hall, in Norfolk, was designed by the greatest Palladian architects, Colen Campbell and James Gibbs, and why the interiors are the handiwork of the incomparable William Kent. Houghton was built by Britain’s first prime minister, Robert Walpole, in the 1720s. In those days, there were no Osbornes around to crush the nation’s aesthetic dreams, and Houghton was built with taxpayers’ money by a PM who fully understood the obligations of patronage. One look at the gorgeous spaces created by Kent in the entrance hall tells you how and why it was worth it. Unfortunately, the practice of encouraging the best artists to work on the best stately homes died out in the 20th century, when modernity went one way and stately homes another. Instead of bringing in new art, the ducal piles began selling off their old art to ensure their survival. At Houghton, big chunks of the original collection have been disposed of. At one point, the staircase leading to the garden had to be sold to pay the taxes. Most recently, that great Holbein in the National Gallery, A Lady with a Squirrel, came from here. So it is with genuine joy that I am able to report a reversal of the trend. The current lord of Houghton Hall, David Cholmondeley, a direct descendant of Walpole, has turned out to be, of all things, a knowledgeable connoisseur of contemporary art. On his watch, Houghton has once again become a must-go destination for modernists. Some of what Cholmondeley has achieved is permanently in evidence, scattered about his grounds. A glistening stone circle by Richard Long on the western lawn keeps changing its appearance depending on the weather conditions. Among the trees, there’s a cheeky plaster cast of a garden shed by Rachel Whiteread. But where the 7th Marquess of Cholmondeley has surpassed himself is in his prescient patronage ofJames Turrell, the US light sculptor. 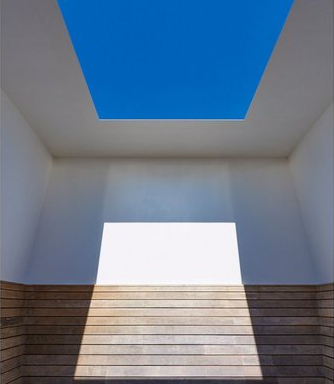 Turrell, who must be counted as one of the greatest living artists, is a rare presence in Britain. His work demands three primal givens that are generally in short supply in the contemporary art world: space, time and sky. All three are available at Houghton Hall, where a beautiful mix of old and new pieces results in the pop-up show of the summer. The Marquess of Cholmondeley has been commissioning work from Turrell since 2000. The first piece to be built here was a Skyspace, one of his mysterious wooden pagodas with rectangles cut in the roof through which you can watch the changing colour of the sky. I’ve seen the heavens turn black in several of these Skyspaces around the world, and can confirm that Houghton Hall’s is the most elegant and best. Another work permanently on show in the grounds is in an old water tower. To experience it, you need to walk into what appears to be total blackness. Five minutes later, it’s still black. Ten minutes later, still black. Fifteen minutes later, something purple begins looming up before you. Twenty minutes later, you find yourself sitting in front of three Rothko-ish purple fogs. The light hasn’t changed. Your eyes have. These skilled tinkerings with our perception of light affect us in ways that seem at once primitive and scientifically exact. Light is doing to us what it has been doing since we descended into our first cave or looked up at our first starry night — delighting and puzzling us with its magic. But in Turrell’s art, the effects are controlled with surgical precision. Einstein has snatched the reins of Apollo’s chariot. Every shadow plays its part. Every beam arrives on cue. Although the various lightworks scattered about the house and gardens constitute a fine adventure at any hour, the best time to visit is late on Friday or Saturday, when, as the night approaches, the entire front of Houghton Hall is bathed in a colour display designed by Turrell to highlight different aspects of the Palladian architecture. The fabulous son et lumière (sans son) lasts an hour and a quarter, and invents colours in the dusk I don’t recall having seen before. They give you a deckchair and a blanket. You bring the prosecco and the dreams. It’s what life’s about. 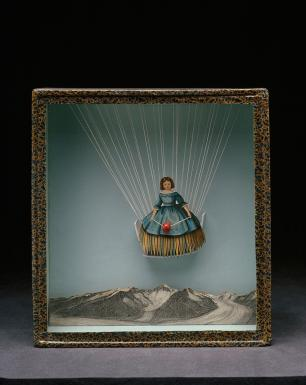 Back in London, another American voyager of the mind, Joseph Cornell (1903-72), is being remembered by the Royal Academy. These days, we would call him an “outsider” artist — a self-taught loner with obsessive impulses who made art on his kitchen table. But back in the 1940s, when Cornell rose to prominence, outsider artists had not yet been invented, so he was ranked as a surrealist instead. Famously, he hardly left his native state of New York, let alone America. Instead, he did all his travelling in the imagination. Scouring junk shops and book stores for evocative foreign ephemera, he would cut it up and reorder it into mysterious assemblages housed in glass-fronted boxes: doll’s houses for the mind. The RA has brought together a large selection of these worlds within a world. Judging by the oohs and giggles emanating from those around me, Cornell’s art will awaken a sense of childish pleasure in many. I found much of his work twee. What’s missing is a range of moods. He doesn’t do bleakness or horror or ennui or sexual passion or any of the darker tones you get with true surrealists. His default mood is a charming longing for faraway places. If all you want from an orchestra is the tinkling of a triangle, fine. I want more.